Luis Urzua, the shift foreman when the mine collapsed, was the last of the 33 trapped Chilean miners brought safely up to the Earth’s surface tonight. A specially designed rescue capsule named “Fenix” brought him and the other miners up from a half a mile underground in less than 24 hours. Overall the rescue efforts went smooth as the miners were trapped 69 days. Chilean President Sebastián Piñera and his wife eagerly greeted each miner over the course of the rescue operation. As many of you know, Marylou was born and raised in Santiago, Chile, the rescue mission was very emotional for her as she watched with excitement as each miner was reunited with their loved ones. There is a God in Heaven who works in mysterious ways. Welcome home Amigos and Viva Chile. 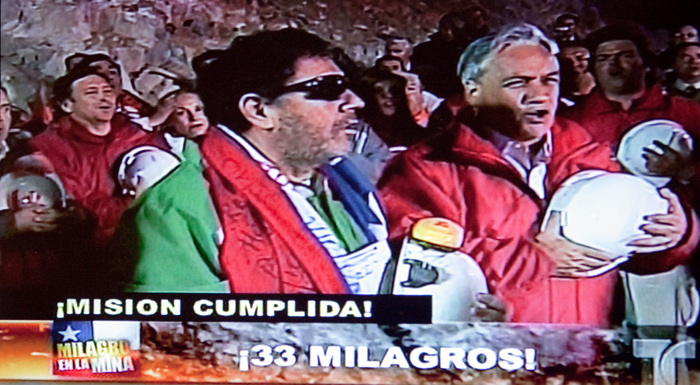 Luis Urzua (left) and President Piñera sing the Chilean National Anthem with miners and rescue workers moments after Urzua’s successful rescue.